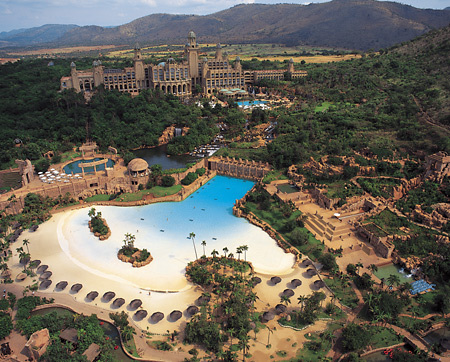 The extraordinary Sun City Resort is internationally recognized as the ultimate African Experience. Well-known on the international golf circuit for the incomparable Nedbank Golf Challenge and famous for the Lost City, fabled to be the ruins of a glorious ancient civilization, which celebrates and resurrects the legends of a mystical past in its glorious architecture and myriad entertainment features. The austere surrounds of the Pilanesberg embrace the Resort which glitters like a jewel in a platinum setting. It's First Class all the way! From sizzling entertainment, to one of the world's most exciting waterparks, to a world-class casino, the Sun City rhythm beats its own drum. A varied and extensive range of conference venues and hotel accommodation is available. From the incomparable Palace of The Lost City to the informal Sun City Cabanas, organizers and delegates are assured of unrivalled convention, banqueting and accommodation facilities. There are 4 hotels at the Sun City Resort all offering superior and unique accommodation, ranging from the opulence of the Palace of the Lost City to the luxury of the Cascades Hotel to the dynamic heartbeat of the Sun City Hotel or the informal and casual elegance of the Cabanas. The Palace of the Lost City at Sun City is one of the most enticing travellers' destinations in the world, a tribute to man's imagination and revered for its art and architecture. The Palace lavishes its guests with 5-star service, and is luxurious in every facet of its fabulous architecture and décor. Lush gardens, tropical birds and water features give The Cascades its sophistication and elegance. The Cascades has a total of 243 rooms and offers a wide choice of rooms and suites. Overlooking the internationally acclaimed Gary Player Golf Course, the Sun City Hotel is home to the Sun City Casino. The ambience of the hotel is one of glamorous sophistication tastefully combined with magical fantasy. The most relaxed and casual of all Sun City's hotels, the Sun City Cabanas opens onto lush gardens leading down to the lake and Waterworld. The Sun City Cabanas has a total of 380 rooms. The following activities and entertainment are available to guests staying at Sun City Resort. Located in The Lost City, the Valley of Waves is a water theme park with exceptional recreational features and activities. One of the rides, the Temple of Courage is an extreme slide with a 17-metre drop. Brave-hearts drop 17 metres down a 70-metre chute, hurtle under a bridge and plunge into the sparkling pool below. This pastime is not for the faint hearted. The 500m long Lazy River will carry visitors on a gentle current past wonderful attractions. There’s a gentle sloping tropical palm-fringed beach and Adventure Mountain’s is children’s paradise with waterslides and pools where they can play or explore in safety. A team of expert lifeguards patrol the Valley of Waves. The screams of exhilaration reverberate off the surrounding rock face of this amazing water park, which has been designed to resemble the re-emergence of a lost civilization. Take a walk in our beautifully landscaped gardens situated in the Valley of Waves. Each trail covers a different habitat and many bird and plant species can be viewed. A beautiful lake surrounds the Cabana's hotel and offers pleasure to all who revel in water sports. The range of water sports is radical, the pleasure intense. Jet Skiing - Try your hand at a watersport that will take your breath away - as you let the throttle go, you feel the roar of the engine between your legs and the erratic pounding of your pulse. Jet skiing is raw power and your craft is set to perform. At Waterworld there are Jetski facilities for beginners and for those with more experience. Come and shred water on our lake. Water skiing - Water Skiing is considered to an extreme sport and lovers of the sport say it is all about making a splash. As you pull out behind the high powered ski boat, the water rushes up to meet you as you gingerly cling to the rope, balancing precariously until the power of the engines levels you out. The thrill of crossing the wave and the power of the spray of the shalom ski is an exhilarating and giddy sensation. There is nothing to beat it on a hot African summer's day. Parasailing - A parasail that keeps you grounded - well almost. As you soar above the tree-line, you feel the gentle throb of the power boat anchoring you to the line, but it's tenacious and that's the adrenalin kick. You gently sway in the wind then nose dive like a swallow as you plummet towards the water, and then suddenly tango into the wind with an effortless ballerina's pirouette. The dense rugged bushveld of the Sun City Resort lends itself to horse riding. Take a gentle canter around the resort on horseback, meander through the indigenous forests accompanied by experienced guides and enjoy the splendour of this ancient volcanic landscape, with a brisk walk or a leisurely canter. One of the finest ways to experience the bushveld is on horseback. You might surprise small game such as bushbuck or duiker and there is also a wide variety of bird life. All rides are led by experienced riders/guides and all riding abilities are catered for. Guests are taken out on either experienced or novice rides so that everyone in the group enjoys a similar experience. Gametrackers are the leading safari guides in the Pilanesberg National Park. Each Gametrackers guide is an authority on indigenous flora and fauna, understanding the delicate balance of the local ecology. Your ranger will guide you through the reserve in an open safari vehicle or on foot, revealing vividly the private lives of the creatures spotted. The Pilanesberg National Park is situated in an extinct rare alkaline volcanic crater in the North West Province of South Africa, adjacent to the world-renowned Sun City Resort. It is one of the largest national parks in southern Africa, and contains a dazzling variety of wildlife including the "Big Five". Game Drives - The emphasis of the Exclusive Safari is to locate the Big 5. Specialist guides guarantee a true African Safari aboard a specially equipped 6-seater Landcruiser. Guests can view Rhino's wallowing in cool mud baths and Bull Elephants fighting for supremacy in the clarity of daylight. Be a silent witness to a Lion kill, as antelopes graze unsuspecting of the danger lurking in the volcanic landscape. Amid the hills far from the Maddened Crowd, you might catch a glimpse of the elusive Buffalo as they wander unrestricted and free. Bush Walks - Take a walk on the wild side - If you're intent on specific game viewing, then the Rhino Hiking Trail will appeal to adventurous guests. Track the White Rhino on foot within the Letsatsing Game Park. A guide will convey his substantial knowledge of these imposing creatures - feel at one with this primitive African creature. There is simply nothing that will compare with an up-close and personal encounter with a wild animal. Hot Air Balloon Safaris - In the early morning, a burst of colour emerges against a flawless sunrise backdrop. Passengers aboard the Hot Air Balloon, can enjoy the taste of South African sparkling wine before viewing the full spectrum of the Pilanesberg National Park. On landing you are whisked away to a game lodge where a sumptuous breakfast is served. This is one of South Africa’s largest crocodile farms and is home to over 300 Nile crocodiles. Feeding time daily at 16:30. Experience the magic of birds of prey flying freely in their natural environment with our free flying displays. Lasting approximately 45 minutes. Spectators will see hawks, falcons and owls at close range. Sun City has two incredible world-class golf courses set against the rugged backdrop of the Pilanesburg mountains. Sun City's two, par-72 championship golf courses offer visitors to Southern Africa's premier resort an exciting and challenging golf experience. The exotic allure of the Lost City Golf Course and the championship nature of the Gary Player Country Club test the grit of many a fine golfer. Both courses were designed by South African golf legend, Gary Player. Gary Player Country Club Golf Course- The Gary Player Country Club is acknowledged as a difficult and demanding course. Since 1981 it has been home to the Nedbank Million Dollar Golf Challenge. The course requires stamina and accuracy from players. We look forward to yet another memorable tournament in 2003. Please note that the course will close in preparation of this prestigious event from 3 November to 24 November 2003. The comparatively flat nature of the golf course is misleading - water hazards, cunningly sited bunkers and pins hidden away on kidney shaped greens makes up for the lack of gradient. Off the back markers the course measures over 7,000 metres which makes it one of the longest in the world. But a variety of tees make it possible to shorten the course and render playable for all levels of golfers. A distinguishing feature of the course is its green's complexes, with strategically placed bunkers, swales and mounds that protect the super slick clover shaped greens. With pristine perfect kikuyu fairways and excellent bent grass greens the course is kept in perfect condition all year round. A feature hole? Well they're all good at the Gary Player Country Club, but for risk and reward the stand-out is the 9th. Play this par 5 from the forward tees and then have a go for the island green with your second and thrill to the challenge of this superb test of golf. Golfers are astounded by the breathtaking beauty of the par-72 Lost City Golf course. The rich green fairways give a dramatic contrast to the bushveld backdrop and the barren waste bunkers are a special feature of this intriguing course. The Lost City Golf Course is flexible: playing off the forward tee a course length of 5,953 metres, extending to 6,983 metres off the back tee. The course provides spectacular views. Throughout the world, gaming has become a fashionable and acceptable form of entertainment. This article serves to guide you through some of the basic rules and etiquette of Sun City's table gaming facilities. The Sun City Casino, situated in the Sun City Hotel, is open 365 days of the year. The tables open for play at 13h00 (midweek) and 11h00 (weekends) until close in the early hours of the following morning. The dress code in the casino is smart-casual. For the first time visitor the casino floor can look quite bewildering, the continuous hustle and bustle of players making their bets. The shouts of joy and disbelief when the roulette ball lands on the winning number. The steady swish of the blackjack cards coming out of the shoe and the general vibe of excitement and anticipation, presents a vista of organised chaos. But you can't help thinking: "Wow", where do I start and how can I get involved? Sun City School of Gaming - The Sun City School of Gaming is pleased to be able to offer free lessons in the skills and etiquette of all our Casino Table Games. Lessons must be booked a minimum of 48 hours in advance through the Casino MVG desk. Groups over 10 people are by special arrangement with the Casino Management and must be booked one week in advance. There is also a gymnasium, spa pool, full locker facility and change rooms, including a steam room and hair salon. Maps are available from the concierge desk for the 3km and 5km jogging trails around both the Lost City and the Gary Player Golf Course. The trails are all very scenic and well marked according to distance and direction. The Outdoor Adventure Centre operates from the Letsatsing Game Park directly adjacent to the Sun City complex and bordering the Pilanesberg National Park. Designed to appeal to those who enjoy extending their minds and bodies, the centre offers an African outdoor adventure. The Adventure Centre offers Quad Bike adventure trails for adults and youngsters, clay target shooting, archery and drum circles. The Quad Bike - The adventure trail takes about an hour and a highly skilled guide conducts the trail. Internationally accepted safety standards apply and no previous experience is needed as instruction in handling the vehicle forms part of the package. The price is R340 per person, and the adventure is not available to anyone under 16. There is a fully supervised circuit event for youngsters. Clay Target Shooting - An elegant and relaxing activity. Instructors guide participants and there is no need for previous experience. The price is R290 per person and is restricted to 20 participants at a time. Archery - Guests are introduced to this ancient art using modern recurve bows and more contemporary equipment such as compound bows and powerful crossbows. The price per person is R180. Drumming - An excellent way for a group of people to get more closely acquainted with the energetic rhythms of Africa. Drummers pay R180 per person. To become a club member, children must complete a registration card. There are presently over 7000 children who belong to the club. The children get sent birthday cards and newsletters three times a year.